Maximizing the power of ingredients by recognizing the distinct flavour of each one is an art. While cooking, I simply take the ingredients in my masala dabba for granted – cumin, chilli powder, turmeric and asafoetida feature in most of my Indian dishes. So I do not think twice before adding ginger and green chillies to a dish! But I was forced to examine this presupposition when I met Mr. Kulbhushan Khanna, a retired Navy commander from Gurgaon, now residing in Pathankot. He reeled off one recipe after another while I kept repeating the same questions: No turmeric? No coriander powder? Not even asafoetida? His answer was simple: Know the power of each and every ingredient. Decide whether it is really needed in a specific dish or not! Maximize its power. Chuck away your stereotyped recipes and habits. Think for yourself and be creative. Needless to say, my interview with Kulbhushanji was a thought-provoking experience. I also came to realize how important it is to keep oneself occupied and happy. 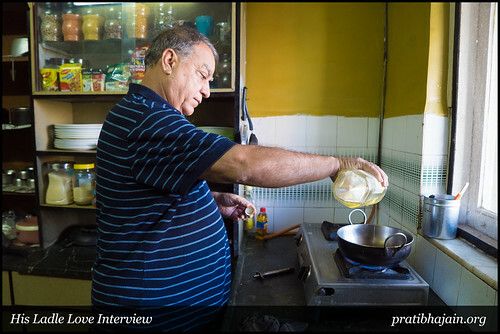 We spoke about many things – life after retirement, being alone and yet happy, exercising one’s creativity and many, many recipes. Namaste Kulbhushanji. To begin with, how long did you work in the Navy? I graduated in 1967 and joined the Navy. At that time, graduation was a sufficient qualification. I served for 20 years and, in 1987, I opted for premature retirement. When did you move to Pathankot? When I retired from the Navy, my family was in Gurgaon. After retirement, I moved to Mumbai and joined ONGC. Later I went back to Gurgaon. At present, I am staying with my niece Nandita and her husband Aseem in Pathankot. Both of them are doctors by profession. I have heard so much about your expertise in the kitchen. Have you always been a good cook? Only since 1990. In my growing years, the food in our house was typical Punjabi vegetarian food. But in the Navy, I was exposed to a variety of cuisines and tasty food. It was then that I became interested in what I was eating. Do you remember your first culinary venture? I remember it clearly. It happened in Gurgaon after my retirement. We had a novice cook at that time. One day, I walked into the kitchen and asked the cook what he was preparing. Out of the blue, I told him which masala to add to the sabzi. I also showed him how to fry the masala perfectly. Over the years, he started cooking very well. He used to make excellent dosa and idli. Did your wife mind your sudden presence in the kitchen? Not at all. I guess she was happy to relax a bit and eat tasty food. At home, it was just the two of us as we did not have any children. After she passed away, how did you manage? She passed away in the Year 2000. At that time, I came to realize the difference in roles of men and women. Women somehow find something to do the whole day at home. They have a different life because of household chores. On the other hand, I had a lot of time on hand and nothing much to do. How long can one read the newspaper? So I just poured all my interest into cooking. 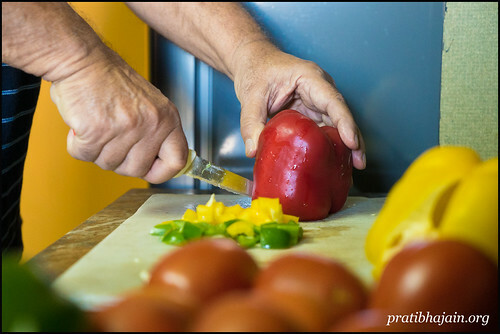 What is it that excites you so much about cooking? It is a creative activity. You can go on innovating. There is just no end to the permutations and combinations of ingredients and flavours. That is so true. But what about measurements – how did you arrive at the perfect measure? According to me, a good cook needs no measurements. It is all about andaaz – one learns to estimate correctly. What dish do you prepare when there are guests? I enjoy cooking non-vegetarian food and my biryani is loved by family and friends. What would you say is your signature vegetarian dish? I would say my garlic chutney. The family calls it Szechwan sauce [laughs]. I prepare it as frequently as most Punjabi families prepare mint chutney. 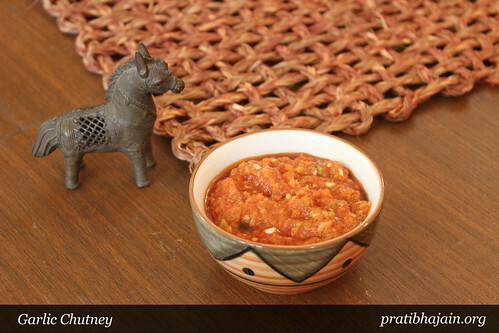 My garlic chutney is an excellent accompaniment with our typical Punjabi food, almost any Indian food. What are the ingredients that go into your garlic chutney? It is a simple preparation with mustard oil, tomatoes, garlic and green chillies. Grind 2 pods of garlic and 10 green chillies into a coarse paste and set aside. Grind 5 tomatoes into a coarse puree. Heat mustard oil and add the tomato puree. Cook until the tomatoes are well cooked. Add 2 teaspoons of Kashmiri chilli powder. Add the chilli-garlic paste and cook for 10 minutes. Add salt, mix well and switch off the flame. Allow it to cool and it is ready. You can use it for a week if kept in the refrigerator. Add acidic acid if you wish to preserve longer. When you pulp the tomatoes, do you remove the skin? I never remove the skin of tomatoes as it is the skin that lends the rich colour. You can try this chutney with and without the tomato skin and see the difference for yourself. Last year in March, when my neighbour and your cousin Sulakshanaji visited you, she returned and raved about your aloo shimla mirch ki sabzi. It is a simple dish, yet delicious and much loved by all of us. Heat the oil and add crushed garlic and thinly sliced onions. Sautè for a while and add potatoes cut into long pieces. Allow to cook uncovered until the potatoes are half-cooked. Now add finely chopped tomatoes and cook until the potatoes are fully cooked. Add salt and lots of thinly sliced capsicum. Cook for a few minutes and switch off the flame. That’s all – as simple as that! All you have added is garlic and tomatoes; not even chilli powder or garam masala! So what it the secret to its taste? Food has taste only when it is cooked with interest and love. Forget about the stereotyped sabzi and masala. Garlic is a powerful ingredient, both in its goodness and flavour. In this dish, I use it in generous quantity for that special taste. While cooking, I also don’t cover the pan with a lid since the dish would lose its fresh colour and crisp texture. So what masala powders do you buy and preserve, like chana masala, garam masala? I have never bought any of these. I am surprised at how sparingly you use turmeric. Don’t we need its goodness in our daily Indian cooking? I add ½ tsp turmeric to a glass of hot milk that I drink every morning. That is the perfect way to ensure its goodness in your system. Most of the masalas lose their quality when they are fried in ghee or oil. What about asafoetida powder (hing)? Oh no, please do not add it to anything and everything. When I think of hing, I think of kadhi. In kadhi, I do not add garlic; instead, I prefer adding hing. I think I need to check many more ingredients. What about coriander leaves as a garnish? Should one think before adding that as well? [Laughs] You can add them as garnish if you like. I don’t really bother as they do not have any flavour these days. I remember the fresh smell of coriander leaves in my childhood. I prefer degi mirch, also known as Kashmiri chilli powder, because of its crimson red colour. Can I conclude that garlic is your favourite ingredient? Undoubtedly yes. In fact, if you enjoy garlic, you must try my rajma recipe. Soak rajma (kidney) beans overnight. Pressure-cook the next morning with half the quantity of salt. Make a paste with some onions, another with tomatoes, and grind 5 green chilles along with 8 cloves of garlic into a fine paste. This is for serving approximately four. Heat the oil; add the onion paste and sauté until it turns light brown. Now add the tomato puree and allow to cook well. Add the chilli-garlic paste to the cooked onions and sauté for 5 minutes. Add the cooked rajma, salt and a teaspoon of degi mirch. Cook for a couple of minutes and switch off the flame. We usually grind the garlic and onions and cook them together so that the raw smell disappears. But you have not cooked the garlic much. You must learn to enjoy the slightly raw flavour of garlic. This recipe, like many of mine, is for garlic lovers. But remember to use fresh rajma beans, even though it is the dry variety. Stale rajma beans never get fully cooked. Now let me share a recipe without garlic, especially as you are a Jain. It is that famous aloo ki sabzi. The one eaten with poori? Yes. Boil potatoes and chop them into bits. Heat oil in a wok and add a teaspoon of jeera (cumin). Next, add chopped tomatoes and roast them until well cooked. Add a pinch of turmeric powder and a teaspoon of degi mirch. Add ½ cup water and allow to boil. Add the chopped potatoes and salt. Allow to simmer for a while. 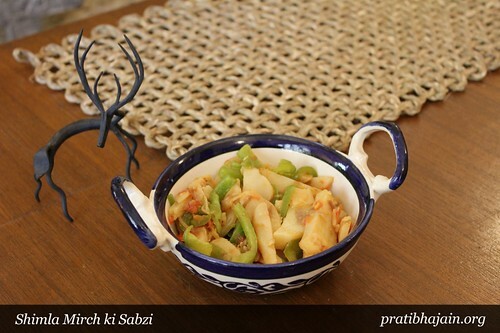 It is so simple to prepare and turns out into a delicious rasedaar sabzi (side dish with gravy). I also noticed that you have not mentioned mustard even once. I add mustard primarily while making pickles. I enjoy preparing instant pickles with seasonal vegetables. 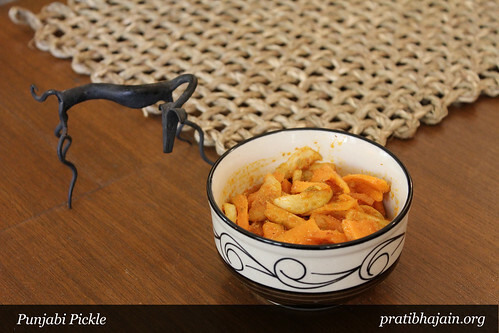 Last week, I made a large jar of our typical achaar with mixed vegetables. That sounds like a must-learn recipe. Can it be preserved? Yes, you can preserve this pickle by adding a teaspoon of acidic acid. All you have to do is chop the vegetables – I like a combination of carrots, cauliflower and turnips (shalgam) – into long pieces and put them on a sunny terrace for about two hours. Heat mustard oil and add chopped ginger, garlic and green chillies. Roast for a minute and add 2 teaspoons each of degi mirch, vinegar and mustard powder. Add a dash of salt and jaggery (shakkar). Add the chopped vegetables and cook for about 3 minutes. Allow to cool and preserve in a glass jar, shaking it at regular intervals for a day or two. Fabulous. Tell me, apart from cooking, what else gets packed into your day? I have always been interested in the stock market. I keep track of what is happening on television. I also enjoy gardening very much. I am growing fenugreek, tomatoes, cauliflower and mint leaves. We have also planted onion buds that should be ready in a couple of months. It’ time for me to show you my garden now. Thank you so much! I am also looking forward to trying out all your recipes. 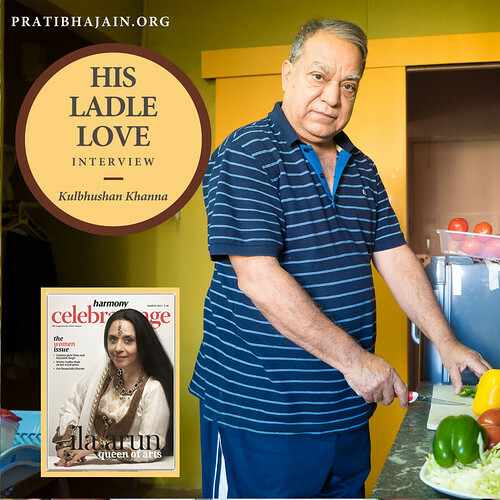 First published in March 2015 in Harmony – the Indian magazine for silvers for the column – ‘His Ladle Love’. A series about men who experience the joy of cooking and can weild a deft ladle in the kitchen.